Hop.Skip.Punch!’s boxing fitness training instructor, Nick Pudney (a.k.a – Pudz) is a local, born and bred on Sydney’s Northern Beaches. As a child Nick tried just about every sport he could. From a young age his idols were Bruce Lee and Mike Tyson who inspired him to try martial arts. He dabbled in an array of styles starting with boxing for a year, followed by Wing Chun Kung Fu for 2 years. Then in 2003 he started training at Lange’s MMA langesmma.com where he has achieved a black shirt rank in Muay Thai Kick boxing, a 2nd degree black belt in MMA (mixed martial arts) and a black belt in Brazilian Jiu Jitsu. Nick also has a cert 4 in sports coaching. 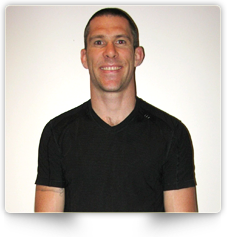 Whilst being a boxing fitness training instructor Nick has also helped train multiple professional fighters and has competed in kick boxing, MMA and BJJ. Fitness training and martial arts is a way of life for Nick. While still training full time himself, he and his wife converted their garage into a decked out gym with mats, weights, punching bags and other exercise equipment. It’s not uncommon for them to train in the evenings after putting their little one to bed. Nick loves being a boxing fitness training instructor and is motivated to share his passion with others. He has been teaching martial arts and running boxing fitness training classes for the past five years. Nick’s teaching style is both motivating and considerate; he’ll make sure you challenge yourself without pushing you beyond your skill or fitness level. There’s only one thing Nick loves more than fitness training and martial arts and that’s his family (and perhaps ice cream!). Nick has a one year old who he is determined will become a martial arts super star, or a ballerina whichever she prefers (a martial arts star!). Nick is passionate to live a healthy lifestyle and stay in good shape. He has a talent for sharing his fitness knowledge and motivating others to train. If you find fitness training a chore then come along to one of Nick’s cardio boxing fitness training sessions and you’ll not only enjoy yourself but also learn something new. If you want to find out more about Nick have a read of his blog or take a look at the photo and video gallery. We hope to see you at a cardio boxing fitness training session soon!